Pune, Oct 25 (IANS) The second One-Day International (ODI) between India and New Zealand here became embroiled in controversy hours before its start with allegations of corruption against curator Pandurang Salgaonkar, who was subsequently sacked by the BCCI. The curator is seen and heard on camera agreeing to the demands. “It will be done,” Salgaonkar is quoted as saying by India Today. Salgaonkar also allowed the undercover reporters to inspect the pitch, in clear violation of International Cricket Council (ICC) and BCCI rules. The curator and others are also seen walking on the pitch. “It’s not allowed still we did it. The BCCI observer is also sitting around,” Salgaonkar said. 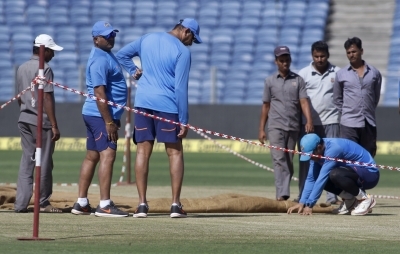 There was speculation that the second ODI may be called off, but the ICC and the BCCI decided to go ahead with the game after ICC match referee Chris Broad inspected the pitch. Later in the day, the BCCI and the Maharashtra Cricket Association (MCA) announced that they have decided to terminate Salgaonkar’s contract. “The BCCI appointed curator Ramesh Mhamunkar was immediately made the point person for the centre wicket and the field of play for the second ODI between India and New Zealand. “ICC match referee Chris Broad inspected the pitch ahead of the match and cleared the same for the game to go ahead,” the statement added. “It a very serious matter. There is zero tolerance for such things. This is more shocking as Pandurang Salgaonkar himself was a first class cricketer,” he added. Salgaonkar represented Maharashtra as a fast bowler from 1971-82. He has also served as chief selector of the Maharashtra Ranji Trophy team.